AH, WILDERNESS. 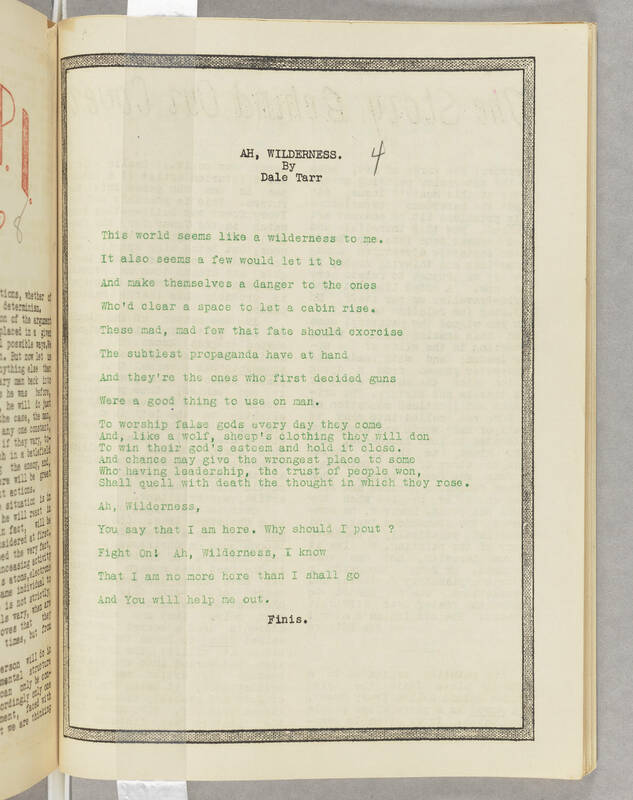 [handwritten]4[end handwritten] By Dale Tarr This world seems like a wilderness to me. It also seems a few would let it be And make themselves a danger to the ones Who'd clear a space to let a cabin rise. These mad, mad few that fate should exorcise The subtlest propaganda have at hand And they're the ones who first decided guns Were a good thing to use on man. To worship false gods every day they come And, like a wolf, sheep's clothing they will don To win their god's esteem and hold it close. And chance may give the wrongest place to some Who having leadership, the trust of people won, Shall quell with death the thought in which they rose. Ah, Wilderness, You say that I am here. Why should I pout ? Fight On! Ah, Wilderness, I know That I am no more here than I shall go And You will help me out. Finis.